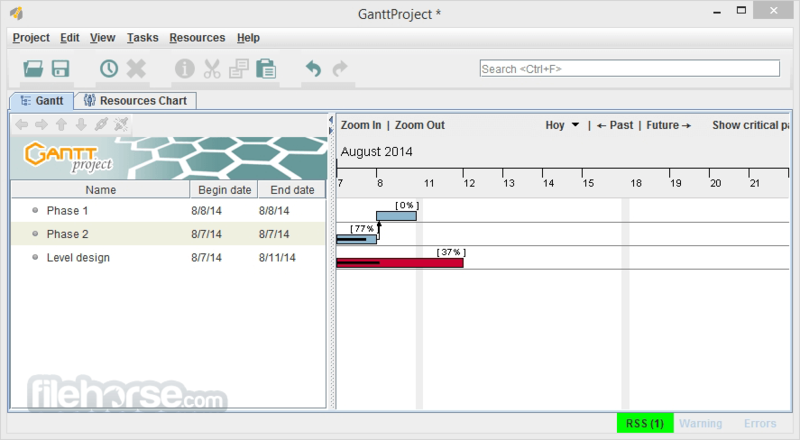 GanttProject is a project scheduling application written in Java and featuring Gantt chart, resource management, calendaring, import/export (MS Project, HTML, PDF files, spreadsheets). A cross-platform desktop application for project management and scheduling. Create tasks and milestones. Aside from the start date and duration, every task may have priority, cost New in 2.7, color and fill pattern, text notes and user-defined custom fields. Organize tasks in a work breakdown structure. Hierarchical tree where progress, dates or costs of lower level tasks is summarized on the higher levels. Summary tasks can be collapsed to hide tasks which are not important at the moment. Draw dependency constraints between tasks, like "start X when Y finishes" and GanttProject will take care of enforcing these constraints. You can add a lag or use other types of constraints. Create baselines to be able to compare current project state with previous plans.. PERT chart for read-only view can be generated from the Gantt chart. Create human resources with the basic contact information, payment rate New in 2.7 and role. Assign resources to work on tasks with different roles and assignment units. Monitor task assignments and see when some resource gets overloaded or is sitting without work. Generate PDF report with a summary, required task and resource information and vector chart images. PNG/JPEG images can be generated from individual charts and printed. Export to CSV to analyze your data in spreadsheet apps. Import from CSV is also supported. Microsoft Project import and export, as smooth as possible. Use WebDAV servers with locks support for concurrent work on the same project. Use cloud storage providers which can mount your cloud disk to your local file system for storing your projects in the cloud. In the local network GanttProject will do its best to prevent concurrent writes.